One of the most meaningful relationships our Founder Kathy Stevens has ever had was with a former cockfighting rooster named Paulie. Paulie, whose escapades and life-changing lessons were depicted in Kathy's first book, Where the Blind Horse Sings, taught us a great deal about chickens' capacity to love, protect, and communicate with humans. 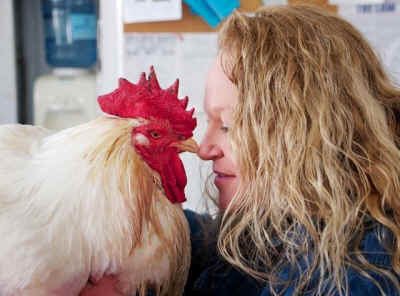 It is so delightful to witness another profound friendship developing between a human and a chicken: this one is between our Animal Care Coordinator, Jenn Mackey, and a 15-pound broiler rooster named Hank. At close to four years old, Hank will likely not be with us much longer. Bone splints in his right leg, a result of industry-induced obesity, prevent him from walking properly: he can barely hobble. So Hank spends most of his day in the medical room with Jenn. "When I walk in each morning and call 'Good morning, handsome Hank!' he calls back to me, and when I pick him up, he buries his head in my arm. When I hold him to my chest, Hank rests his head on my shoulder and wraps his wings protectively around me. Hank has taught me so much more than any book or study ever could about the emotional capacity of chickens. I can't really find the words to express how much I love him."